It�s the last week of January and the Super Bowl is the only football game remaining this year. That means college hoops is about to take center stage. And who doesn�t love that? Plenty of small-conference teams are off to hot starts so far in league competition. Oakland (9-0) and College of Charleston (8-0) come to mind. But nobody�s dominating like Murray State, which is quietly putting together a rather legendary start to Ohio Valley Conference play. The Racers are 10-0 in the OVC and have won eight of those games by double-digits. Murray State has been tested exactly once, during a 62-60 win over third-place Eastern Kentucky. Morehead State, the second-place team in the OVC at 8-1, lost by 30 points to the Racers in December. How�s this for a stat? Murray State is averaging a 15.9 point margin of victory during OVC competition, according to the handy calculator I just bought at the campus bookstore yesterday. That�s unheard of in any conference. Murray State last made the NCAA Tournament in 2006 under current Cincinnati coach Mick Cronin. Barring a major upset in the OVC Tournament, the Racers could enter the NCAA Tournament with an undefeated league record. An at-large is out of the question because Murray State hasn�t beaten a single quality team, but it played competitively in its three losses to California, Louisiana Tech and Western Kentucky�all on the road. I only recognize one player on the Racers� roster, and that�s Isaac Miles, a former starter at Creighton. However, while Murray State doesn�t boast a star, it will continue to gain national recognition if it keeps destroying OVC teams at this pace. G�Town has lost 10 of 11 at the Carrier Dome. 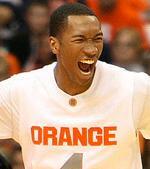 As Pittsburgh proved earlier this year, however, Syracuse isn�t invincible at home. The Orange have more depth and overall talent and should protect its home court tonight. Charleston has already taken down NorthCarolina, so what�s so hard about Western Carolina? Cornell and Baylor took Kansas to the wire at Allen Fieldhouse, but the Jayhawks still haven�t lost there in 51 games. Manny Harris is back. That�s great news after missing a game against Purdue, but will it be enough? Rhode Island dropped a home game against Xavier last weekend. A road win at Dayton could make up for the loss. Kansas State beat number-one Texas and then lost at home to Oklahoma State. What gives? This game could decided the C-USA title down the road. Vanderbilt is back in the top 25 after a strong start to SEC play. Tennessee needs to play well to avoid a second-straight loss. Two middle-of-the-pack Big 12 teams jockey for position in Stillwater on Wednesday. Florida State has the size to disrupt Duke, but will its guards come to play? New Mexico needs to gain quality wins to avoid slipping to the bubble. I realize the Lobos are ranked, but it�s important for Steve Alford�s team to win games like this against elite teams. Purdue will get payback here after losing at the Kohl Center a few weeks back. Don�t overlook this Summit League battle between first and second-place teams.